Home > magnet-applications>Applications of magnets>What is a knife holder? What advantages does it bring? 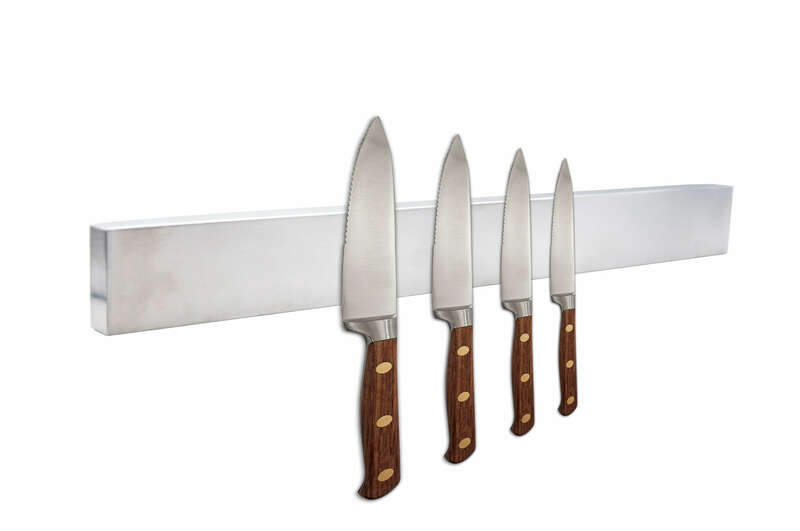 The magnetic holder for knives and tools is an optimal magnetic solution and very suitable for storing kitchen elements that will not occupy space in the workplace. If you have a lot to do in the kitchen of your house, you know the problem. When preparing food, cooking and baking, knives are always needed. Meat needs to be cut into portions, vegetables chopped, the potatoes peeled. For all these jobs, knives of various types are needed and should be available at your fingertips. A common, but impractical way to short-term temporary storage is simply on the work surface. A much more convenient option, in a suitable position, is a magnetic holder, where the knife simply hangs. When preparing food in the kitchen, knives of various sizes are the most commonly used. In addition to these knives, many other items are required in all kitchens, such as cheese graters, peelers, cutting boards and much more. A support for knives avoids disorder and dangers to people of knives left everywhere. On the support, knives are available at just the right time for work in the kitchen. A magnetic holder for knives not only provides additional work space, but also frees up valuable storage space in drawers. This free storage space can be used for other storage purposes. An alternative to magnetic holders would be a block of wood in which knives are simply inserted. This block will inevitably then be on the work surface and, therefore, will occupy a valuable space on the work surface. Another advantage of a knife holder, is to improve hygienic conditions in the kitchen, especially on the area of ​​the work surface. When using a wood storage block, it is almost inevitable that leftover sliced ​​meat or other raw foods remain glued to the knife and, therefore, inevitably form a breeding ground for harmful bacteria. The magnetic holder prevents this danger and therefore contributes to an increase in hygiene. Powerful magnets used in the magnetic holder design makes a significant contribution to improving the quality of the kitchen. Let us convince you through our advice and appropriate arguments. A magnetic tape is suitable due to its inherent flexibility for many purposes. It can be easily attached to any type of metal surface. Its magnetic properties are permanently guaranteed. Depending on the application, the magnetic tape can be supplied both in the unprocessed version and in a roll version or in plates of different dimensions. Our product range is large enough to satisfy your wishes and expectations. Contact us at any time and let us convince you of the quality of our magnetic tapes. In our era of rationalization and automation, not only the world of work has radically changed. The effects of these working conditions extend to the private and domestic sphere. Therefore, it is essential that the time available for cooking is used optimally. Magnetic knife holders not only contribute to a better organisation of the work surface in the kitchen, but are also very practical.